Redsn0w 0.9.5 has been updated! which brings long awaited support for Windows users to jailbreak iOS 4 GM (formerly iPhone OS 4) on iPhone 3G and iPod touch 2G. Like the last release, this update also includes optional support to enable multitasking and wallpapers on iOS 4.0 on iPhone 3G and iPod touch 2G which otherwise are disabled by Apple. 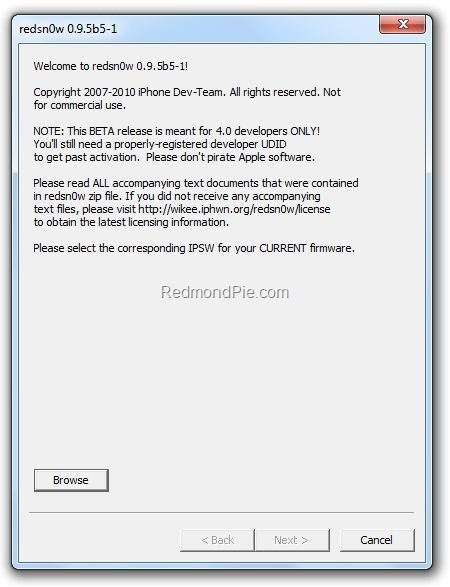 The redsn0w beta has been updated for 4.0GM on iPhone 3G and iPod touch 2G (non-MC version). Multitasking and homescreen wallpaper are turned on by default (Apple doesn’t normally allow this on these 2 devices). You can deselect these features if you choose. A version for Windows is now provided. Just like our other betas, this one intentionally doesn’t “hactivate” the iPhone. Please wait for Apple’s public release of 4.0 for that part of it. YOU SHOULD STAY CLEAR OF THIS BETA SOFTWARE IF YOU RELY ON A CARRIER UNLOCK. That’s because the beta redsn0w works only if your device has already been upgraded to the stock 4.0beta1/beta4/GM IPSW from Apple, which contains a baseband update. If you installed that IPSW, you’ve already lost the carrier unlock until the next planned release of ultrasn0w and blacksn0w. Instructions to jailbreak iPhone 3G and iPod touch 2G on iOS 4.0 GM using Redsn0w 0.9.5 as usual exactly similar to the last release. Please read all the instructions posted here carefully before upgrading and jailbreaking your phone to iOS 4.